I love being outdoors & observing nature and take alot of photos of animals in the natural world. My brother has uploaded a couple videos he took, showing inter-species conflicts in the animal kingdom. The first one showed a wasp & a hummingbird fighting over the contents of a backyard feeder. Recently I went to my second viewing of "Star Wars VII: The Force Awakens". This time I watched it in 3D, & I enjoyed it with more of an eye toward the details that I missed opening weekend. Being a life-long Star Wars fan, I read forums and articles discussing the movies. There is a lot of speculation about the next two episodes in the series, concerning the story & all the different characters. That's the greatest thing about this story, or any powerful work of fiction- it can spur the imaginations of the masses. Yes. I fully expect the 7-9 trilogy to be about finally uniting both sides of the Force. • Eps. 1-3: The attempt of the Jedi to deny all elements of the dark side lead to their eventual destruction. • Eps. 4-6: The attempt by the Sith to eliminate the light side leads to their destruction. Interestingly, both Vader and Luke use both sides of the Force to different degrees to (probably?) destroy Palpatine. • Eps. 7-9: As mentioned before, I think we'll see a final uniting of both sides of the Force. I always find it interesting that the light side and dark side of the Force are interpreted as representing good and evil. The great realization that both sides can be used for good and both sides can be used for evil will be the ultimate fulfillment of the prophesy. This would be in line with the resolution to the Matrix movies- in which Neo did not end up destroying the machines... but merging with them. Unifying duality, not engaging in conflict, is the solution to the question of existence. So, it will be interesting to know if Luke's experiences lead him to the conclusion that a higher conception of the Force is one beyond the concepts of Light & Dark. 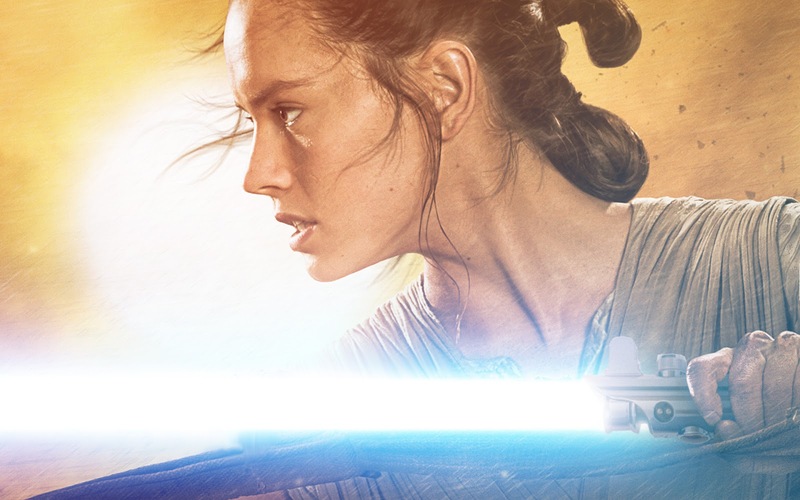 Rey could be a catalyst for this merging of The Force. She has passion & emotional vitality, but is also able to connect to the stillness that allows the Force to flow through her. Perhaps she will be able to utilize the full spectrum of The Force's power, as opposed to a Jedi or a Dark Side user who only facilitates one particular aspect. I think The Force Awakens movie poster hinted at the fact that Rey will be influenced or tempted by the Dark Side, with Kylo Ren's red blade directly aligned with her staff. Like Luke who was also directly confronted with evil, this will give her intimate insight into the darker aspect of The Force. Ultimately, though, Rey's soul is good at the core and will not be easily corrupted, similar to Luke's resistance to Vader & The Emperor. She will use even this knowledge out of compassion & a sense of right. If they show it in depth, the contrast between Snoke's training of Kylo & Luke's training of Rey will be very interesting. I'm sure it will present two very different perspectives on both The Force and events in the Star Wars galaxy. I am looking forward to finding out more of the background of Luke & Snoke, as well as the origins of Rey, in the next movie. "The Force Awakens" was a jumpoff point for this new series, and I'm hoping that the next episode goes deep & philosophical like Yoda's teachings in "The Empire Strikes Back". Those are the mystical elements of Star Wars that have always spoke to me. So far, it looks like this sense of mysticism & spiritual philosophy will remain as an integral element to the stories. There are many movie & media spinoffs planned, but I hope that the central theme of the main movies remains an individual's connection to The Force. On a related note, here is an article that points to the extraordinary abilites that we humans have in our reality. The potential of the mind is vast & limitless, and we may very well be capable of "Jedi-like" powers. Since my last post was about a bizarro world where chimps evolved from humans, I thought I'd share this positive news about our fellow simians. I've also posted before about laboratory chimps being set free & the moving way they react to their newly-acquired freedom. 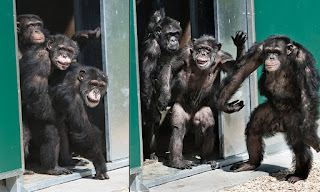 Recently, the U.S. National Institutes of Health (NIH) announced that it will be retiring the last of it's lab chimps used for scientific research. They will be retired to an animal sanctuary to live a more enjoyable life. It is a small dent in the cruelty and horror humanity inflicts on animals continuously around the world, but it is at least a step in recognizing the intelligent minds and conscious perceptions of these beings. How would you feel if you were put in a cage & experimented on? That is exactly how a chimp, monkey, or any other sentient creature feels. An animal is just not thinking about it's misery in the form of language. The pleasure expressed when the animals are free is undeniable. I saw this funny image on the Tumblr blog Inner Cosmos, showing an alternate reality in which apes have evolved from humans. 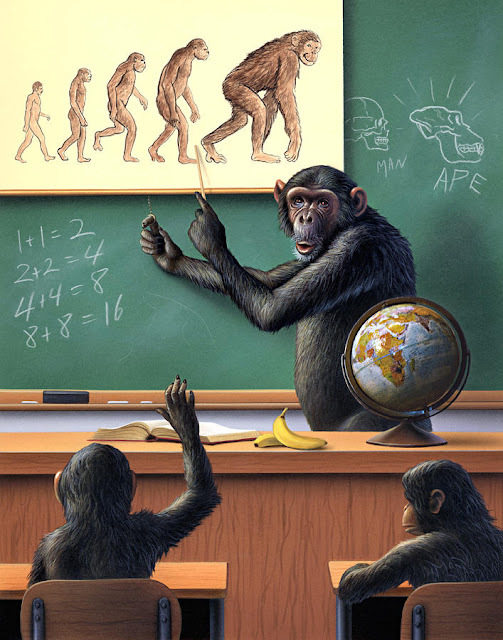 This bizarre fact is being taught to a class of intelligent monkeys, using a chart showing the reversed evolution of hominids. The writing on the board also shows that math is universal, since arithmetic was apparently independently derived by these smart apes. I try to inform myself in all areas so that I have a general knowledge of many things. There is an infinite amount of information to be gained, & I want to know as much of it as I can absorb. Scientific topics are a favorite of mine, because I feel like scientific investigation can help us understand reality. The more I learn about knowledge & discoveries from different scientific fields, the more I feel like I am looking into a never-ending fractal dimension of information. Biology and quantum theory are two areas that I have been focusing on lately, listening to many lectures about the realm where these intersect. My mind absolutely boggles when I think of the activity happening of cellular & molecular level, throughout all living things. It's crazy to think of proteins and cells interacting, moving, & sending signals to each other at a nonstop pace! The macrocosm mirrors the microcosm, and vice-versa. This fascinating article explained how the mass behavior of animals is giving researchers a hint into how matter becomes self-organizing into living systems. It's something that is ultimately truly mysterious, but by trying to figure it out, we can better understand ourselves & our world. 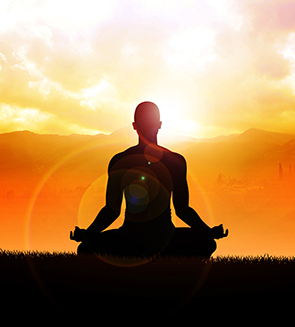 I have learned about & tried different types of meditation. I find these practices to be helpful in cultivating an interesting & meaningful experience in this life. Mindfulness meditation is an approach to everyday life, in which direct attention is maintained by the observer consciousness. "When walking, just walk. When sitting, just sit. But above all don't wobble!” - Lin Chi. Here is an article on the specific meditation technique of mindfulness practice. 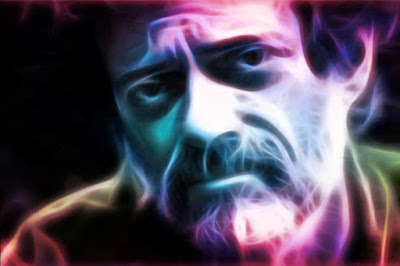 Terence McKenna was a thinker, writer, public speaker was interested in such topics such as- altered states of consciousness, culture, and technology. He was, in my opinion, one of humanity's greatest minds. I would recommend any one of his talks that can be found online. I've listened to dozens & dozens of hours of his recordings & I never get tired of his loquacious episodes into the nature of the mind & reality. This is a extensive list of some of Terence McKenna's very quotable thoughts that I came across recently. It's a new year, and I thought I'd post about the future- specifically futuristic monkey-like robots. 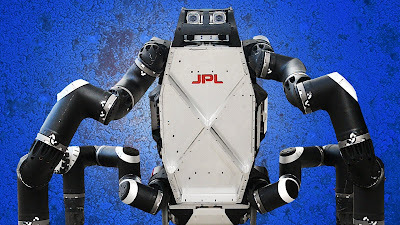 I've had this article filed away, that talks about a robot designed by NASA's Jet Propulsion Lab. The RoboSimian can shift between a wheeled configuration and a mode using four appendages that resemble a cross between monkey limbs and a tentacled creature like an octopus. Although many of the DARPA robots were humanoid & bipidal. However, there's no reason robots need to look like humans, or any other known creature.